When it comes to the golf swing and instruction, one of the most overlooked areas of focus might be the takeaway. Those first few moments immediately after a player starts their backswing are incredibly important because it’s what sets a swing up for success later on. If the swing starts off poorly, it will, no doubt, end poorly as well. That’s why the takeaway is so critical to a successful golf shot. That being said, it’s often overlooked because it’s a little unclear as well. There’s a clear beginning, but not a clear end point. It’s hard to really say when the takeaway has been completed. We know it as a subset of the backswing, but there’s no universally recognized point where it ends. Therefore, it’s ignored for other, more tangible aspects of the swing, like the top of the backswing position. 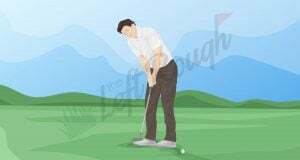 For the purposes of this article though, the takeaway starts when you begin your swing and ends when your hands and club head get to belt height. So, in this article, we’re going to take a closer look at the takeaway. It’s the very beginning of every golf swing and, if you get it right, you’ll have a better chance of hitting the shot you want. What are the Different Ways to Take the Club back? To start out, let’s talk about the different types of takeaways. The main two that people talk about are the one-piece takeaway and the right arm takeaway. When deciding which technique you’ll use for your swing, simply do what feels most natural and keeps the club in the proper position best. There’s no need to overthink the takeaway, but it is important to pay attention to what you’re doing because it’ll influence the rest of your swing. 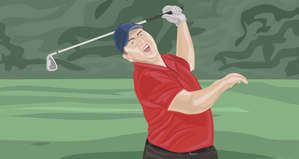 The one-piece takeaway gets its name because it focuses on one main part of the swing. In this case, the front shoulder. Everything else stays as silent as possible. With the one-piece takeaway you simply concentrate on bringing your lead shoulder under your chin. This movement will shift your arms and club backwards with very little movement in your arms, wrist, or hands. The advantage of this type of takeaway is that you minimize the amount of unnecessary movement in your takeaway. This allows the club to stay on the right path longer, thus getting you into the correct position at the top of the backswing. You’ll also notice that your head ought to stay really still because all you’re doing is moving your front shoulder under your chin. Keeping your head, and sternum, still will make it easier to make solid impact because you haven’t swayed back or dipped down in the backswing. The back-arm, or right-arm as it’s commonly known, takeaway is similar to the one-piece in that it focuses on one part of the takeaway. I like to call it the back-arm takeaway because it would not be a right arm for left-handed players, so for the sake of universality, we’ll call it the back-arm takeaway. The difference between the one-piece and back-arm comes in what you focus on and how many moving parts are present. With the back-arm takeaway, all you’re doing is pulling your back arm (right arm for a right-handed player) backwards. You can imagine that there is a person standing next to you and you’re either handing them the golf club with your back arm or shaking their hand. This keeps the club on the right path throughout the takeaway. In this takeaway, you’ll notice that your arm, not only moves backwards, but it also rotates slightly so that your back-hand opens up, so that the palm is facing out. The advantage of this type of takeaway is that it helps engage the rotation in your forearms. If you struggle to get the club head rotated through impact then you may want to give this type of takeaway a try. How do I start the takeaway? Now that you know the two main types of takeaways, we’re going to discuss how to start the takeaway. The best piece of advice I like to give people is to only use your big muscles, like your shoulders, rather than your small muscles, like your wrists. Smaller muscles ought to be used later in the backswing, but to start, keep those small muscles silent. The other big move in your takeaway is a turn around your spine. Imagine that your spine is like a tetherball pole. You want to wrap your muscles around that pole, so to start, you’re simply making a twisting-type movement with your side muscles. This will allow the club to pull away from the ball without any wasted movement. Next, imagine a line being drawn between the target and your ball, extending indefinitely in both directions. You want to keep your club head hovering over that line as long as possible. Keeping your wrists silent will help you do this. If your club travels outside that line, you’ll notice that your shot shape will be a slice or fade. Similarly, if the club head travels inside the line too quickly, you’ll tend to draw or hook the ball. So, keep the club on that line as long as possible. Eventually you’ll have to bring it inside the line, but try to delay that as long as possible. As you work on your takeaway, there are some great checkpoints you can use to make sure that you’re in the correct position. You want to make sure that your head is in the same exact position it was at your address. Like I mentioned earlier, be sure that you don’t let it drop down or shift backwards during your takeaway. Have a friend take a video of you from the face-on position. Your head ought to look the same at address and at the end of your takeaway. Next, you want to make sure that your club head covers your hands. Meaning, if someone stood behind you, your club head would travel directly over your hands at belt high. A good way to check this to set up a camera behind you in a down-the-line position and take a video of your swing. Pause the video when your hands get to belt height. If your club head travels directly over your hands, you’re in the correct position. Trouble happens when the club head gets too far outside or inside your hands. Finally, let’s focus on the palm of your dominant hand (right hand for a right-handed player). In that same video that we mentioned above where you shot a down-the-line view and paused it when your hands got to belt-height, look at your dominant hand. The palm of this hand ought to be facing outwards, or away from your body. This will mean that the club face is square. Another way to check this is to see if the toe of the club is pointing towards the sky at this same position. This will allow you to get the club back to square at impact easier and more consistently. There are a couple common mistakes that I often see in the takeaway. Both of them relate to not using the correct wrist action. The first is when a player uses too much wrist too early in the swing. A lot of times this means that a player’s first move is with their wrists instead of shoulders or spine turn. A takeaway where the wrists are engaged too early on can lead to a couple different things later one. It could result in a path that comes too far inside the ball, which would result in a draw or a hook. It could also result in a backswing that goes too far at the top and throws the whole swing off balance. Another thing it could do is lead to a flippy and inconsistent impact position. Next, a lot of golfers will over or under-rotate their hands in the takeaway. As I said above in the “Dominant Palm” section, you want the toe of the club pointing towards the sky at belt high. Over or under-rotation of your hands will mean that the toe either faces behind you or out in front of you. Both of those positions will hurt your shot direction. 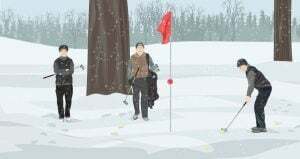 You’ll find that you’ll either hit the ball left or right of your target, depending on rotation speed and your dominant hand. You may even see that your shots miss both directions because you can never figure out how quick to rotate your hands. 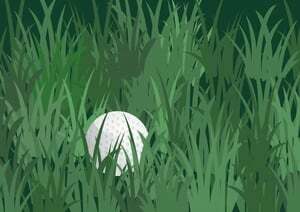 Finally, the last mistake that golfers tend to make in their takeaway is that they bring the club too far inside or outside their target line. I talked about this above in the “Draw Line” section. Basically, if you bring the club too far inside your hands, you’ll tend to swing with a path that is too far inside to out. The reverse is also true, if you bring the club too far outside then your path will be too far outside to in. Both of those paths will create a shot that is difficult to control the direction. Now, there are a couple great drills that you can practice both at home and on the course to help create an ideal takeaway. First, I’ll talk about an on-course drills you can use (though the at-home drills can be used on-course as well). 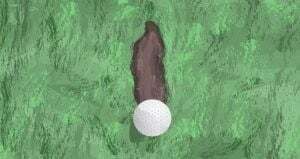 How do I fix my Takeaway during a Round of Golf? Have a playing partner stand behind you, in line with an imaginary ball and target. Bring your club back to belt height and have that person “catch” your club head. 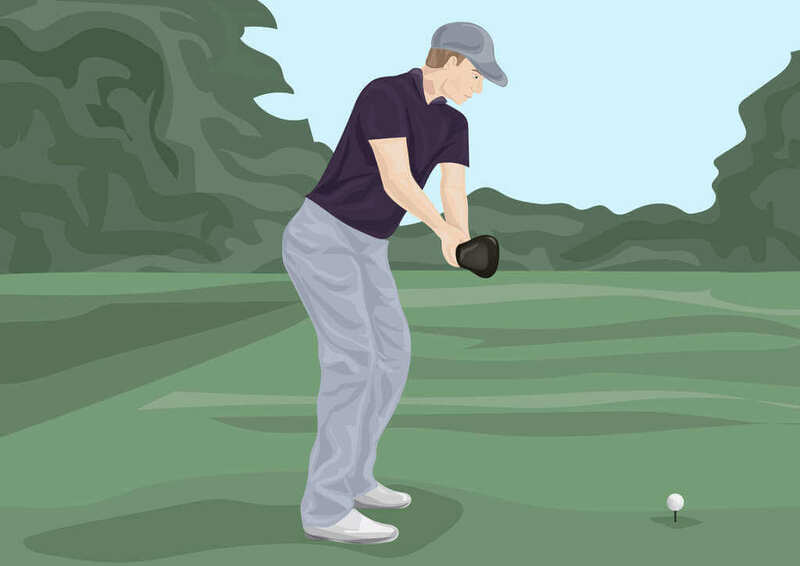 Make sure they only catch your club head if it is in a position that would cover your hands. Simply repeat that takeaway several times before hitting your shot to get the correct feel. This drill helps you keep the club on the correct path during your takeaway. How do I work on the Takeaway at Home? Cross your arms on your chest. Set up in your address position and take your imaginary swing by just turning. Simply feel like you are twisting around your spine. This drill will help you feel the correct spine twist and keep your head still throughout the takeaway. 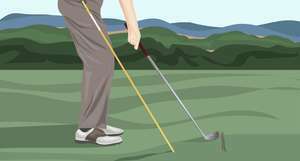 Another at-home drill you can use is to set up at address without a club. Hold your hands flat against each other so the palms are facing each other. Make sure that when your hands get to belt high, the palm of your dominant hand is facing out. This drill will make sure that you have the proper club head rotation in your takeaway. If you take these pointers and work them into your current takeaway, you’ll soon see that your overall golf swing is more consistent because you are starting the swing correctly. Remember, don’t ignore the takeaway because it is an important part of the swing sequence. The takeaway will influence everything else in your golf swing, including the final result.